DayZ, the Arma II mod that places players in a tense, realistic survival against a zombie outbreak, is easily one of the most compelling PC games of the year. It's amassed more than 400,000 users since its release in April and, if its current rate holds, will surpass half a million sometime in the next week, the mod's creator said yesterday. "We've got 420,000 now. We'll have 430,000 tomorrow," Dean "Rocket" Hall, the mod's creator, told Eurogamer. Hall was appearing at Rezzed, a PC and Indie game show going on this week in Brighton, England. In the panel, Hall said he wanted to see DayZ become a standalone game, possibly free-to-play. Hall is a multiplayer designer for Bohemia Interactive, the maker of Arma II. 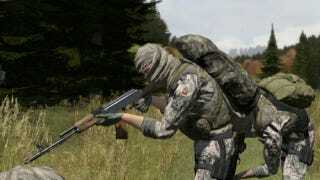 DayZ's meteoric growth has torched five servers, Hall said. Really, they lost five servers to overheating. "We have trouble telling the difference between a DDoS and whether some YouTube channel has posted a video of the game," Hall said. As for new features, Eurogamer reported that dogs will be coming to DayZ. Hall specifically said a German Shepard will be added, though more pressing matters have delayed its introduction.